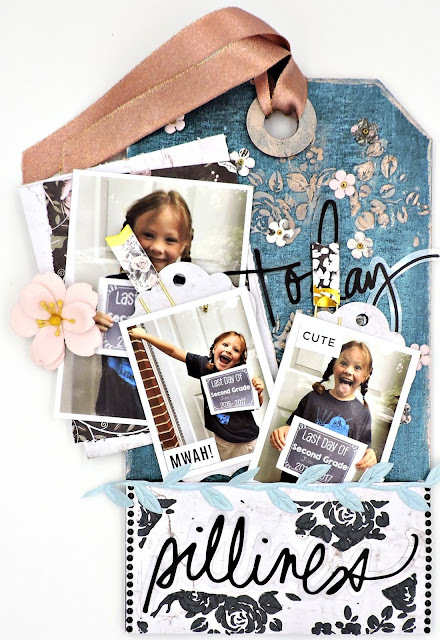 I just may have mentioned how much I love the Tim Holtz Etcetera thickboard tags that were included in the "Spring Grunge" Project Kit from Swirlydoos. Not only are the sizes of the tags amazing, but they take any amount of mixed media perfectly! I used the larger of the two tags for the Kit Reveal; here's what I did with the smaller one, featuring my granddaughter's last day of school pics. After priming the entire surface with black gesso, I used a stipple brush and my fingers to apply the Prima Opal Magic Wax from the Mediums Kit to my tag and allowed it to set. Next, I figured where I wanted to place the "Today" sticker and stenciled some vines around the area, using one of the Tim Holtz mini layering stencils from the Project Kit. I used the Deco Art Metallic Lustre from the Embellishment Kit on the reinforcement circle before gluing it to the tag. While I had it out, I applied it around the sides and here and there over the stenciled vines. The main photo was matted with a few scraps of pattern paper with some packaging between the layers to add some dimension. The smaller photos were glued to some packaging and then to a couple of tags that I cut with a Sizzix die. The paper clips from the Main Kit were attached to the tags and a couple of the Heidi Swapp word jumbles were adhered to the photos. A scattering of blooms from the Flower Add-On and some of the gorgeous sparkle ribbon from the Main Kit and I called it done.